Rising specialty drug costs threaten to erase progress by the Affordable Care Act to lower Medicare patients’ out-of-pocket costs and close a drug coverage gap known as the “doughnut hole,” a USC study has found. “Medicare beneficiaries who take specialty drugs typically incur very high out-of-pocket spending. This raises concerns about affordability and health because patients who struggle to pay for their drugs may not take their medicine as prescribed,” said Erin Trish, a lead author and an assistant research professor at the USC Schaeffer Center for Health Policy and Economics. The “doughnut hole” is the gap in patient coverage between Medicare Part D’s prescription drug coverage limit and the “catastrophic coverage” threshold. Once a patient has spent $4,850 in a calendar year out of pocket, including help from discounts, he or she moves into catastrophic coverage and pays 5 percent of prescription drug costs for the rest of the year. The remainder is paid by the federal government and the patient’s insurance plan. Five percent may not sound like a lot, but if the price is very high and the patient takes these drugs month after month to treat a chronic condition, those dollars can really add up. Previously, patients caught in the doughnut hole had to pay the full cost of their drugs until they had spent enough to reach catastrophic coverage. In 2011, the Affordable Care Act began to close the gap with a combination of drug manufacturer discounts and plan payments. Specialty drug prices, however, continued to rise, driving up costs elsewhere in Medicare coverage — and for catastrophic coverage in particular, USC researchers found. Some prices of the most expensive treatments nearly doubled. USC researchers found that total average annual drug spending — Medicare plus out-of-pocket costs — increased from $18,335 to $33,301 per patient during the five-year period of the study. The study, published online in the journal Health Affairs on Sept. 7, was based on a 20 percent random sample of Medicare Part D patients from 2008 to 2012. The 2012 sample included an estimated 6.7 million patients who had purchased direct coverage. Medicare defines specialty drugs as those that cost $600 or more each month. An estimated 1.4 million Medicare beneficiaries are on specialty drugs, and of those, an estimated 440,000 are on one or more of the most expensive specialty drugs, according to the researchers. 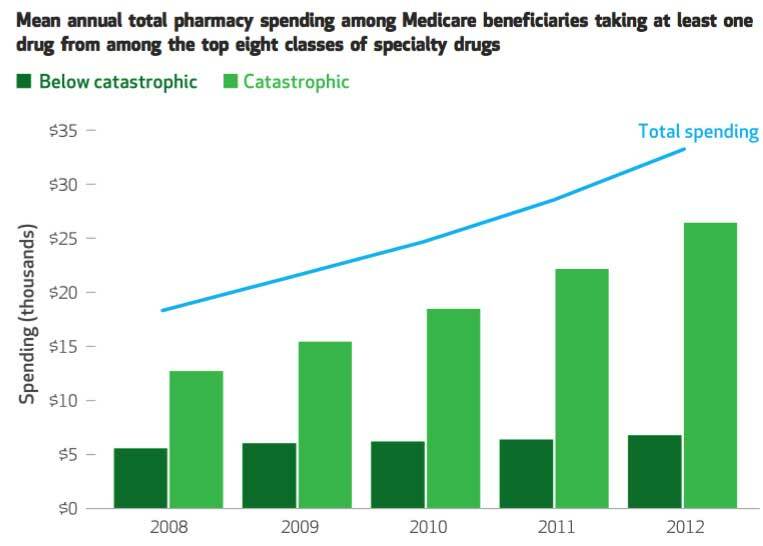 Average expenditures for some of the expensive specialty drugs rose rapidly from 2008 to 2012. The researchers found that the average per-patient spending on multiple sclerosis agents increased 97 percent to $37,952. Oral cancer agent expenditures increased 84 percent to $43,092. Antiretrovirals to treat HIV patients were on the on the lower end of the scale. Even so, they rose 38 percent to $18,668. The researchers had focused on patients within the sample — 84,721 — who were on specialty drugs. Of those, 33,435 were identified as prescribed one or more of the most expensive drugs, which treat illnesses such as cancer, rheumatoid arthritis and pulmonary hypertension. The federal health care law had made a difference for the patients on specialty drugs who were in the doughnut hole. From 2010 to 2011, average out-of-pocket spending for patients on the most expensive specialty drugs dropped 26 percent, from $4,482 to $3,314. But average annual out-of-pocket expenditures in catastrophic coverage nearly doubled over the five-year span of the study, from $651 to $1,250, the researchers found. The average out-of-pocket expenditures for patients in all phases of coverage combined had decreased only 5 percent in those five years. Patients needing the multiple sclerosis treatments were quickly triggered into catastrophic coverage, hitting the threshold as early as February, while an increasing number of rheumatoid arthritis patients hit the threshold by May. 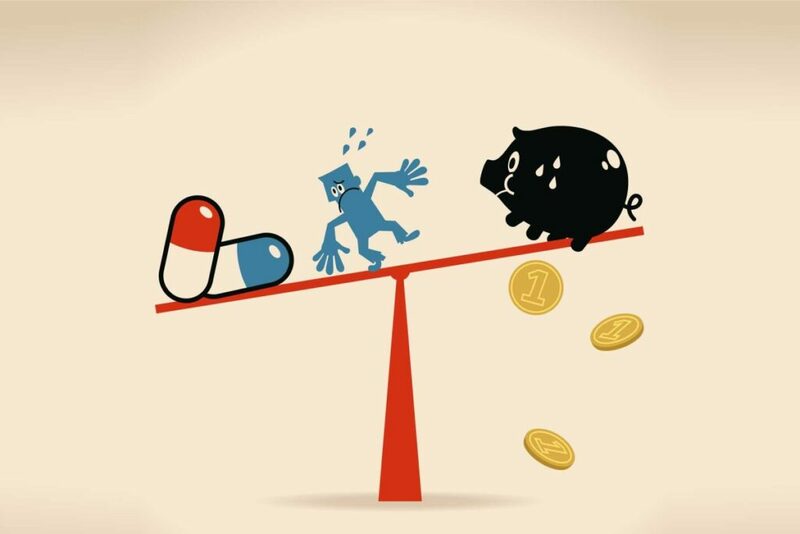 “Any gains made in helping patients caught in the doughnut hole to pay for their medications were nearly entirely offset by the increases in out-of-pocket spending that patients incurred once they reached the catastrophic coverage phase,” Trish said. The researchers called upon policymakers to consider proposals that will further limit seniors’ out-of-pocket liability for prescription drugs. They cited as strong examples a bill in Congress, “Reducing Existing Costs Associated with Pharmaceuticals Act of 2016,” that would eliminate cost-sharing for beneficiaries in the catastrophic phase, and a House Budget Committee resolution to cap annual out-of-pocket spending for beneficiaries in the traditional Medicare program. The researchers also recommended a similar catastrophic coverage cap for patients enrolled in Part D.
The study was funded by the National Institute on Aging. Co-authors were doctoral student Jianhui Xu and Associate Professor Geoffrey Joyce, both of the USC Schaeffer Center.